This weekend the kids headed out with Matt to watch a little basketball. We've been trying to expose them to women's sports whenever possible and they had a blast at this game (free t-shirts and mini basketballs certainly helped). Of course, EJ had the play-by-play on what the cheerleaders dance routine and what they wore. The girl loves a fancy outfit! While they were at the game, I was checking out a bridal show with some lovely (and super fun) ladies. 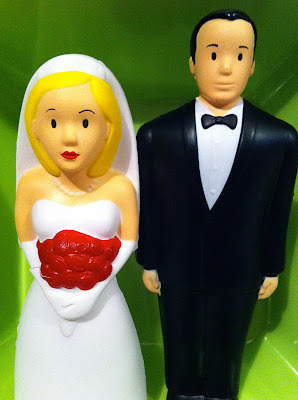 We saw some fun fashions, tasted lots of yummy cake, and I scored this awesome foam bride and groom set. The girls think I got them as a gift for them, but I kind of dig them myself! It was a movie weekend too. 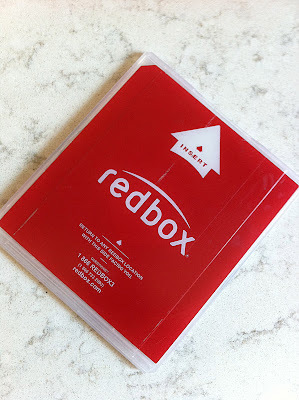 Have you played the Redbox trivia game? The questions are pretty darn easy and if you answer 5 correctly, you get 50 cents off your next rental. This weekend I watched: 50/50, The Ides of March, Moneyball and Midnight in Paris. Clearly, I have taken advantage of this discount. I recommend all of the movies too. Speaking of movies, I added the answers to Friday's Movie Playlist post in the comments. If you haven't checked it out, please head over and give it a shot. 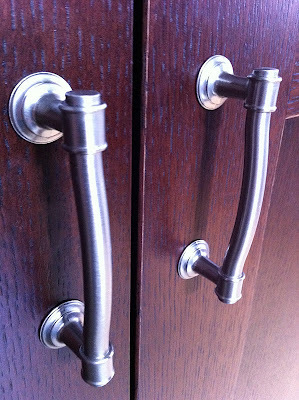 Matt got all our hardware installed in the kitchen. I can't even begin tell you how truly happy this makes me. It is just so much easier to use our kitchen. And...we are so close to done with the kitchen now. We need to rehang our main light fixture and figure out the flooring and then we are DONE! Matt was busy working...I was busy shopping! I had a coupon that was only good for Sunday, so I headed out and bought yarn for two upcoming gift projects. I also used some yarn from my stash to create another present, but I'll share more on that tomorrow. And the best gift project of the weekend, was a hat for Matt! He patiently helped me by trying on the men's hats for our hat project and really liked them. So this past week, I made one just for him. He wore it all weekend and I'm pretty sure he wasn't just patronizing me. Busy weekend! Sounds like it was both productive & relaxing -- the perfect kind. How was Midnight in Paris? It's next in my Netflix queue. Are we going to see the kitchen soon? And um-who are the warriors? Not patronizing at all, I'm tempted to wear the hat around the office. Although hopefully not with such an ailing look to my face. The team we saw was WI Lutheran College. No real reason we chose them, other than they are close. Love the idea to expose the kiddos to women's sports. We need to do this more as well. Especially since Mad is now in basketball and soccer. hi, it's claire from farfromharmfarm. nice weekend! 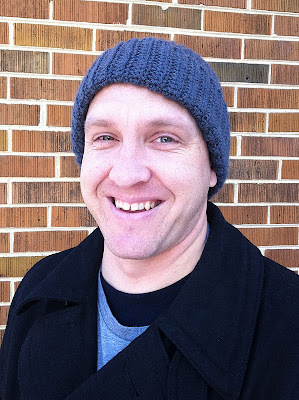 i'm knitting the hubby a hat too! Sounds like you guys had a great weekend! We also try to take in women's sports. Soccer, basketball and volleyball are big ones around here. Love the hat! Can't wait to see what projects you are going to be working on with all that new, yummy yarn. I love that you are purposeful in taking your kids to see women play sports.